NUS Libraries is Now on Facebook! Visit our Facebook fan page to get all your latest NUS Libraries’ news and updates, without leaving the social network. We’ve even integrated our Flickr, Youtube, Slideshare and Twitter accounts to the Facebook page, so you’ll get one-stop access to our various social media channels. And to thank you for ‘liking’ us on Facebook, we have an exciting contest with really cool prizes! 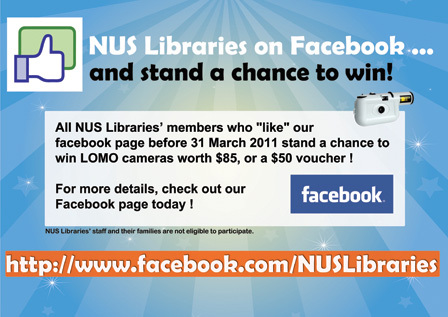 All NUS students, staff and personal external members who ‘like’ our page before 31 March 2011 will have their names entered in a lucky draw, to win one of 3 LOMO cameras worth $85 each. Simple, basic and truly analog, LOMO cameras are a fun way to explore photography! And to up the excitement further, you could win a $50 voucher, if you are our Mystery X Fan. Mystery X is a random number we’ve selected, and will only reveal at the end of the contest. So if you’re the Xth person to ‘like’ NUS Libraries on Facebook, you win the $50 voucher! Visit NUS Libraries on Facebook today, and you could win! Don’t worry, if you’ve already ‘liked’ us on Facebook, you’re in the running as well!